Dog doors are generally designed to be safe for any pet. The panels are often designed with soft vinyl that does not trap or injure the dog. Dog doors also sometimes consist of permanent magnets to reduce drafts. Cheap easily replaceable pet doors are made from plastic and as such are not robust enough for boisterous pets. A cat flap or cat door is a hinged flap set into a door, wall or window to allow cats to enter and exit a house on their own without needing a human to open the door, while offering a degree of protection against wind and rain entering the dwelling. 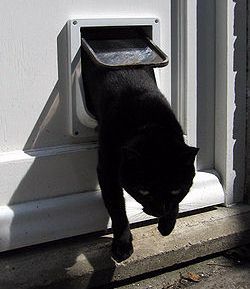 Cat flaps are popular in some countries, particularly the United Kingdom where it is believed that about 90% of cats have access to the outdoors. A dog door is a hinged, spring operated or magnetized set into a door, wall or window to allow dogs to enter and exit a house on their own without needing a person to open the door. Flaps are hung from the top of the opening and do exactly that - flap. The flaps swing both ways, and are often magnetized, so it will stop swinging after the dog goes through. A slide bolt lock is included, so you can lock the flap for security or when you don't want the dog to go in or out. They can also be made smaller for cats. Dog doors generally must be bigger than cat flaps and therefore are often constructed differently. Except in rural areas, they tend to give access to fenced-in yards or gardens rather than the neighbourhood at large. Dog doors are found to be convenient by many dog owners, because it lets their dogs come and go as they please, reducing the need for trips outside and unwanted behavior such as the dog scratching on doors or walls.